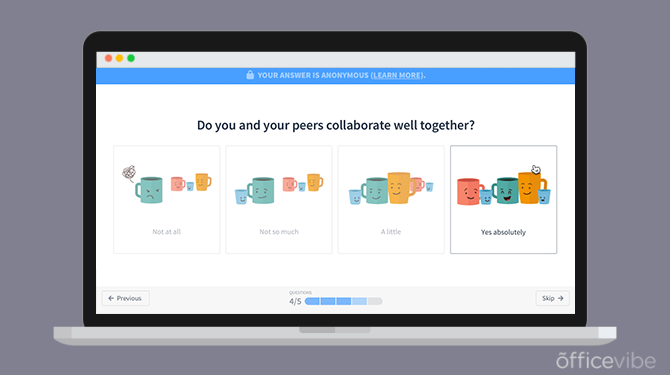 In a perfect world, employee surveys wouldn’t need to be anonymous. Unfortunately, most corporate cultures don’t really allow for full freedom of expression, so anonymity is important. For example, if I’m worried that the responses won’t be anonymous, chances are I’ll report stronger feelings about my boss than I truly feel, or I might not respond at all. An anonymous employee survey helps remove the fear from employees, and allows them to be more open and honest. Let’s go through some of the benefits anonymity, and then I’ll explain exactly how it works in Officevibe, to make sure it’s clear for everyone. The biggest benefit of having employee surveys be anonymous is that you can really get employees to express their concerns. When it’s anonymous, employees are less worried about getting in trouble and are a bit more free to speak their minds. One obvious issue with an anonymous survey is that you can’t figure out who raised the issue, but what you should be focusing on is the feedback itself. You’re missing the point if you’re trying to figure out who said it. At the end of the day, that’s not as important as addressing the issue that was raised. Sometimes, follow up is necessary, and there are ways to do that while still maintaining anonymity (more on this later), but here are a few of the benefits of having anonymous surveys. The biggest benefit of having an anonymous survey is that employees will be more open and honest. The anonymity will make employees feel psychologically safe, so they’ll be more comfortable saying what’s truly bothering them. When you offer anonymous surveys to your employees, you make them feel like they’re listened to. You’re letting them know that it’s okay to give feedback, and that they have a say in what happens at their organization. By making them feel listened to, they’ll be more engaged at work. When employees are engaged, they’re more productive (12% more productive to be exact). If you’re acting on the feedback that employees give you, then in theory, you should be making them happier, which should lead to increased employee retention. Anonymous surveys can help you improve retention. We really respect every user’s privacy, and we want to make sure that they’re only sharing what they’re comfortable sharing. This is why our employee survey software’s data is aggregated and anonymized. However, we want to create an environment where managers can see what’s wrong in an organization, so that they can fix it. For example, if managers can see that employee wellness is low, they can start an initiative to improve it. For example, if you answer a 5 question survey about employee wellness, and all of your answers are negative, managers will be able to see that the overall results are low, but they WILL NOT be able to see individual responses. Let me be very transparent, and go through each activity one by one, and explain how we handle privacy. Like I mentioned, these are fully, 100% private. No manager can ever see an employee’s individual response. It’s important for us that employees using the platform understand this. We will never show managers these answers, no matter how much they ask. This is something we spoke a lot about internally, and we decided that it’s better to make sure the users feel comfortable answering than to satisfy the curiosity of managers. Everything is aggregated anonymously and presented to managers in a powerful, yet simple engagement report. This is exactly what managers see in the platform. The focus is on the overall score, and drilling down into each of our 10 metrics. Again, we don’t show individual employee’s responses. This is simply an aggregated score to give you a sense of what’s going on at work. There are also tips to improve based on the lowest scores. In Officevibe, we ask contextual follow up questions after some of the survey questions. When they’re submitting their feedback, they have the option to choose if they want to be anonymous or not by default. All of this is presented in a report that displays all of the feedback that you’re allowed to see. For example, if you’re the manager of the IT team in Seattle, and your permission settings only allow you to see feedback from that group, then that’s all the feedback you’ll see. You’ll either see the employee’s face or a silhouette if they chose to be anonymous. One of the coolest features in Officevibe is the ability to reply to employee feedback. One of the biggest challenges for us was ensuring that employees could remain anonymous while they continue to reply to feedback that they gave. The employee will always remain anonymous, because we want to focus on the feedback itself, not the person that gave it. The employee needs to feel comfortable using the system. Are Employee Surveys Really Confidential? Using a third-party vendor to help you administer the survey and results will definitely help, but there is a responsibility that you have as well. In Officevibe, we have several ways to make sure an employee’s answers are completely confidential, but there are ways around it if you try hard enough. This is something we’re working on improving, but I wish these “improvements” weren’t even necessary. The problem with most anonymous surveys is that it becomes a “witch hunt” of who said this negative piece of feedback instead of focusing on the feedback itself. The sad part is that in the end, it’s you as a manager that suffers. If you break an employee’s trust, they won’t want to give you feedback anymore. You’ll have all of these issues that go unreported, issues that could potentially be disasters. Turnover will increase, engagement will drop, happiness will drop, your employer brand will suffer, etc. I apologize for painting such a dramatic picture, but it’s true. It’s all built on trust. If you trust your employees enough not to hunt them down, you might not even need the survey to be anonymous in the first place. Do You Think Employee Surveys Should Be Anonymous?